This gorgeous designer style bracelet will add that touch of class to any outfit. 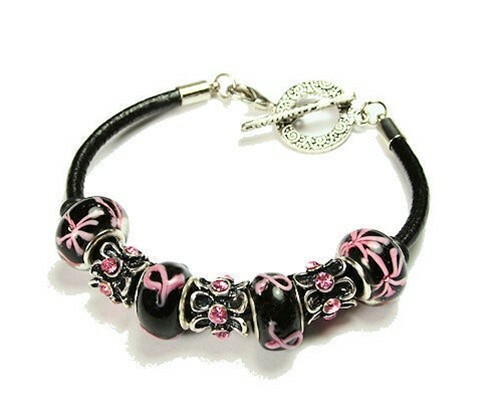 The bracelet features two pink ribbon beads, two pink flower beads and three black accent beads with Swarovski style crystals. 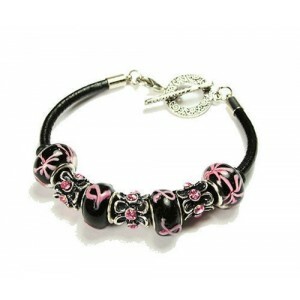 The bracelet has a total of seven beads set on a black leather toggle bracelet. Size 7.1/2". Show you support with this gorgeous design!